Top Rated US Seller | 90 Day Warranty | Free Shipping!! Bohm B-66 Noise Cancelling Headphones in excellent condition. with case, cords and paperwork..
BOHM B-66 Wireless Bluetooth Noise Canceling On-Ear Silver Black Headphones. Condition is Used. Shipped with USPS Priority Mail. Very good condition with only some small signs of use. Ships Priority Mail! Authentic Bohm and amazing sound. BÖHM"s powerful headphones allow you to truly experience and enjoy crisp, vibrant, rich textured sound and powerful bass. Escape the everyday with your favorite tunes and audiobooks anytime, anywhere. Equipped with the latest active noise cancellation technology with ambient noise reduction, BÖHM"s B76 headphones will give you up to 16 hours of focused comfortable listening! Item has a few marks and scratches. Item has been tested and powers on. All parts/pieces are included. Manual is included. Retail packaging shows slight signs of wear or damage. These advanced Bluetooth earphones from BOHM help you disconnect from your surroundings while disconnecting from the headache of tangled wires. Make this easy lifestyle upgrade to enjoy the latest word in Bluetooth headphone technology and functionality. Everything works as it should, includes carrying case, charging cable & Aux cord. Please take notice that ive put black electrical tape on the right side due to a break. BUT everything works as it should and in no way does it affects its performance or wearability. All sales are final, although item is covered under ebays return policy. Thanks for LQQKing! BÖHM Bluetooth Wireless On-Ear Noise Canceling Headphones - Brown/ Gold BOHM. Condition is Used. Shipped with USPS Priority Mail. BÖHM Wireless Bluetooth Over Ear Headphones B76 New!!! ACTIVE AMBIENT NOISE BLOCKING BOHM B76 has Active Noise Cancelling which will cancel most deeper sounds around you. Noise Cancelling function is not as effective with higher, sharper sounds. EXTRA INFORMATION. Our goal is to keep you satisfied and resolve any issues you may have. Want a powerful pair of bass headphones?. The two high-end drivers crank out powerful, thumping bass, prominent mids and truly sparkling highs. BÖHM Bluetooth Wireless Noise Cancelling Headphones With Inline Microphone - Black / Silver. BÖHM B-66 Bluetooth Wireless Noise Cancelling Headphones W Inline Microphone. Shipped with USPS Priority Mail. Opened box. Never used. No returns accepted. All sales final. I will try my best to resolve any problems you may have to make it a positive experience. BÖHM Wireless Bluetooth Over Ear Cushioned Headphones Active Noise Cancelling - B76 (Tan). ACTIVE AMBIENT NOISE BLOCKING BOHM B76 has Active Noise Cancelling which will cancel most deeper sounds around you. BHM Wireless Bluetooth Over Ear Cushioned Headphones with Active Noise Cancel.... Condition is New. Shipped with USPS Priority Mail. Bohm B66 Wireless Headphones - Black/Silver - Certified Refurbished. These advanced Bluetooth earphones from BOHM help you disconnect from your surroundings while disconnecting from the headache of tangled wires. BÖHM has incorporated the most advanced active and passive noise cancelling technology in its headphones. BÖHM's powerful headphones were made so YOU can truly experience and enjoy crisp, vibrant, rich textured sound and powerful bass. Cushioned Foam Ear Pads Cup Entire Ear for Up to 16 Hours of Comfortable, Relaxed Listening. Attractive Sport Headset with Foldable Design is Great for the Gym, Jogging, Cycling & Long Car Travel. With carrying case, cords and paperwork.Advanced Bluetooth wireless headphones. 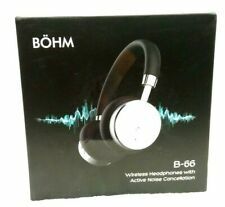 BÖHM 66 WirelessNoise Cancelling Headphones in excellent condition. With 2 high end drivers cranking out thumping bass, prominent mids, and sparkling highs, these wireless Bluetooth headphones provide the listener an intensely detailed listening experience. Powerful, thumping bass, prominent mids and truly sparkling highs. The driver units. BÖHM advance bluetooth headphones will help you. Want a powerful pair of bass headphones?. The two high-end drivers crank out. BÖHM B76 Over Ear Cushioned Wireless Bluetooth Headphones with Active Noise Cancelling - Black/Silver. ACTIVE AMBIENT NOISE BLOCKING BOHM B76 has Active Noise Cancelling which will cancel most deeper sounds around you. PREMIUM STEREO DRIVERS With 2 high end drivers cranking out thumping bass, prominent mids, and sparkling highs, these wireless Bluetooth headphones provide the listener an intensely detailed listening experience. BÖHM B66 Bluetooth Wireless Noise Cancelling Headphones with Inline Microphone - Black / Silver. BÖHM's powerful headphones allow you to truly experience and enjoy crisp, vibrant, rich textured sound and powerful bass. Equipped with the latest active noise cancellation technology with ambient noise reduction, BÖHM's B76 headphones will give you up to 16 hours of focused comfortable listening! Premium stereo drivers: enjoy thumping bass, prominent mids & sparkling highs with this premium bluetooth headset's 20Hz-20KHz frequency range. Want a powerful pair of bass headphones?. The two high-end drivers crank out powerful, thumping bass, prominent mids and truly sparkling highs. BÖHM Wireless Bluetooth Headphones with Active Noise Cancelling Headphones Technology - Features Enhanced Bass, Inline Microphone & 18-Hour (Max) Battery - Gold/Tan, B-66. THE ITEM WAS TESTED 100% WORKING GOOD, IT HAS SCRATCHES FOR NORMAL USED. There will be a sticker on the item. ACTIVE AMBIENT NOISE BLOCKING BOHM B76 has Active Noise Cancelling which will cancel most deeper sounds around you. Noise Cancelling function is not as effective with higher, sharper sounds. B╓HM products have a 1 year manufacturer warranty. Bohm - B66 Wireless Headphones with Active Noise Cancellation Black Silver. Type: Headphones. Features: Noise Cancellation. Connectivity: Wireless Connector(s): USB 2.0. Notes: Condition: used but item is very, very good condition as you see pictures. BÖHM B66 Bluetooth Wireless Noise Cancelling Headphones with Inline Microphone WIRELESS OVER EAR HEADPHONES WITH MIC Advanced Bluetooth 4.0: Industry-leading CSR bluetooth 4.0 supports A2DP, AVRCP, HFP and HSP for a fully wireless experience stream music to your wireless bluetooth headphones from your PC, smartphone, tablet more with over a 33-Foot wireless range.DJ STYLE HEAD SET Premium stereo drivers: enjoy thumping bass, prominent mids sparkling highs with this premium bluetooth headset's 20Hz-20KHz frequency range.NOISE CANCELLING BLUETOOTH HEAD PHONES Active Noise Cancellation decreases most of the surrounding low frequency ambient noiseANSWER CALLS ON HEADPHONES 18-Hour rechargeable battery: charge your wireless headphones for 3 Hours enjoy up to 16 hours of playtime (18 Hours talk time). Answer incoming call. BÖHM Wireless Bluetooth Over Ear Cushioned Headphones with Active Noise Cancelling - B76. LUXORY OVER EAR HEADSET Cushioned Foam Ear Pads Cup Entire Ear for Up to 16 Hours of Comfortable, Relaxed Listening. Com: BÖHM Wireless Bluetooth Over-Ear Headphones with Active Noise Cancelling - B76 (Brown Gold): Electronics. ACTIVE AMBIENT NOISE BLOCKING BÖHM B76 has Active Noise Cancelling which will cancel most deeper sounds around you. Attractive Sport Headset with Foldable Design is Great for the Gym, Jogging, Cycling & Long Car Travel. Manufacturer Model. BÖHM Wireless Bluetooth Over-Ear Headphones with Active Noise Cancelling - B76 (Brown Gold). ACTIVE AMBIENT NOISE BLOCKING BÖHM B76 has Active Noise Cancelling which will cancel most deeper sounds around you. ACTIVE AMBIENT NOISE BLOCKING BÖHM B76 has Active Noise Cancelling which will cancel most deeper sounds around you. Noise Cancelling function is not as effective with higher, sharper sounds. BÖHM products have a 1 year manufacturer warranty. BÖHM's powerful headphones were made so YOU can truly experience and enjoy crisp, vibrant, rich textured sound and powerful bass. Equipped with the latest active noise cancellation technology with ambient noise reduction, the B76 headphones will give you endless hours of focused comfortable listening! Used, good working condition, no power adapter. Comes as the pictures. BÖHM Wireless Bluetooth Over Ear Cushioned Headphones With Active Noise Cancelling - B76.